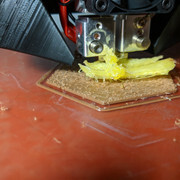 OK, Love how great our Taz 6 single extruder works. Prints amazing thing! Basically it seems that everything we print after the first couple layers one or both filaments will be jammed due to heat creep. We then swapped out the fan for a larger 80mm fan on the heat sink with a funnel. Seemed to help a bit. It only printed PolyLite PLA with 50% chance of printing a single color. Turns out one of the gears that pushes the filament had become stripped due to all the jamming so they swapped it out for a new printer head due to the issues with the extruders not holding temperature. Turns out the new printer head has NO improvement over the last one. Any thoughts on what to do at this point or should I just give up on the Dual Head? I had a similar issue. The temperature was uncontrollable and they have a recall on V3 heads. If you want to fix it yourself there are the instructions they sent me that worked. I soldered mine and the temperature variations went away after. 1. Turn the printer off, and disconnect the toolhead. 2. Take off the fan shroud around the nozzle. There should be 3 screws that connect it to the body. Once you have disconnected that, find the connector for the thermistor. I have attached a photo of what it looks like. 4. Once you have pulled the pin out, it is time to tighten the crimped wires. Take a pair of needle nose pliers, and clamp where the wire meets the pin. You do not want to break anything, but you want it to be tight. 5. Do the steps above for the second pin. 6. Once you have made sure that both are tight, follow steps 9 and 10 of the previous guide to re-pin it. 7. Put back together the toolhead, and try another test. We should see more consistency, and less errors. Note that we have seen this procedure fix this in a majority of cases, but as per our service bulletin on the issue we have found a solder connection to work better, so we do recommend sending the toolhead in for repair. I think when you tell people to "Power off the printer" you need to make sure the power cable and the USB cable are both disconnected. A friend used a brass brush to clean the gunk off the nozzle and got a bit of a shock with the power off. Never happened when removing power to both USB and power cables.